Many brides dream of having a destination wedding. Think of how wonderful it would be to have a wedding on the cliffs of The Ritz Carlton in Maui. Well I can tell you first hand having been a wedding photographer for a wedding at the Ritz Carlton in Maui that it was indeed drop dead beautiful. And even more impressive than the beauty of the entire thing was the astronomical expenses. It wasn't the expenses of the hotel so much as it was unexpected things like shipping 28 boxes of supplies for the wedding via UPS. Then there is travel, hotel, meals and everything else. Though you may not have the budget for an expensive and elaborate destination wedding, you may also not have the heart to go down to your local golf course to sign up for a wedding reception. A viable alternative is a local-destination wedding. Before the drug wars Mexico was becoming a popular place for such an event. There were nice hotels offering beach weddings for around a 70% savings of that of a similar venue in the United States. And though they still offer these weddings if go south of the border for your wedding it will greatly cut down on your guest list. People you'll want at your wedding simply won't show up. ll offer these weddings if go south of the border for your wedding it will greatly cut down on your guest list. People you'll want at your wedding simply won't show up. If you take the idea of a local desination wedding and keep in on US soil and perhaps closer to home you'll probably want a change of scenery. The venue reviews have featured neat options like winery weddings such as Ponte and Keyways winery. 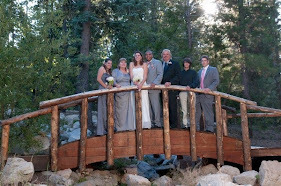 More and more we get called to photograph weddings in the mountains such as Lake Arrowhead and Big Bear. The popularity of these close but significantly different wedding venues have grown over the years. There are upscale resorts that cater toward the bride who wants more of a hotel type wedding experience. But for those who want more of a mountain, woodsy, rustic cabin experience without slipping into the cheap motel look and feel we've found a little gem, Pine Rose Cabins. 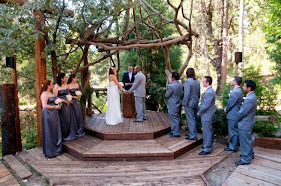 Pine Rose offers not one but three different locations for hosting a wedding. The largest holds up 200 guests which was actually the wedding location my bridal couple selected, the other holds up to 90 and the last location holds 40 or fewer people. They have different packages with different options which can make your job easier with an all inclusive vendor list. This option works well for some brides but most of our brides want more of a say in really important things like who their photographer and DJ's are. At the very least you have options and you'll know that if you do decide to have your wedding here you won't be scrambling to find vendors who will service your wedding. What type of bridal couple will like this place? From time to time we get a bride who is having a golf course wedding and we'll ask her to step off the sidewalk onto the grass for a few pictures and she'll simply refuse. She doesn't want to get her dress dirty. If this in any possible way may be you then stick to having a metropolitian hotel wedding. Though the grounds of Pine Rose are well maintained if you have a decent photographer he/she (or me) will make you walk in the dirt for some really wonderful images. Embrace the beauty. The one word that the bride in the pictures really related to best with this wedding venue was the word "rustic." Riight now you may be wondering if that is politically correct jargon kinda like how real estate agents refer to cramped rooms as "cozy." The term "rustic" can be thought of in a good way. It's a place that reminds you that you are outside with nature. It's more kick back than anything. But if you don't want the word "rustic" to be used to describe your wedding then there are some really wonderful Marriot hotels waiting to talk to you. They are located everywhere. Pine Rose Cabin is unique enough to really stand out. The place has trees and lakes and streams and everything else you would dream of it having. Yes, there are many wonderful spots to take pictures. But it's also a bit of a challenge as well. There is a bridge that is perfect for group shots that when I've seen other photographers shoot it the pictures don't get enough flash coverage. What a lot of photographers do to avoid such issues is to shoot people in the shade. You don't have that luxury here. The bridge screams out for group photos. So, to make up for this you may want to consider doing your group pictures closer to sunset when the lighting isn't as harsh. It's really easy to believe that as you look around that there are so many wonderful spots that "any" photographer would do it justice. Having shot weddings for over 15 years I rate the difficulty of this venue as "moderate." The hills around the grounds make for its own set of challenges and sometimes due to placement of the streams and ponds you can't exactly get to the right spots as easily as you would think. Therefore I find this place to be a bit tricky at parts to photograph. If you have a newbie wedding photographer hooking you up a "deal" you can insist that they do a site visit before your wedding. This probably will have little impact on the photos in the end because the challenges of this place may prove to be too much for them. But at the very least they'll know what they are up against and won't be able to pass along excuses to you later on. Going up to Big Bear you have the potential to go up many windy mountain roads. When you're going here, leave extra, extra early and take the big chill pill. You will get behind slow vehicles from time to time, and the windy roads can make you and especially your passengers sick. There are some nice look out points on the way up, plan on stopping at one or two just to get some fresh air. One the way down the mountain you can pick up speed very easily and sometimes it's hard to realize how fast you are going. If you want to be Speed Racer on the way down you aren't going to save that much time. Please, please please drive safely. Especially at night. It sometimes takes days to find people who have driven off of mountain roads. Just really take it nice and slow and you'll be fine. Drinking and driving is never a good idea, but this is one place where it's an even worse idea. Your closest airport is Ontario which is about 90 minutes away. If you are having a lot of realtives and friends coming from out of town you may need to get a shuttle van. There is no indoor facility to speak of. If you get rain you'll need to check to see what they can do to set up a tend or make alternate plans. The good news is that since it's up in the mountains it may get warm but rarely hot. Getting cold is more of a possibility especially in the fall. Overall this place is great. If you are going to have a local destination wedding you will first need to figure out where you want it before selecting the venue. Chances are that you won't go up to Lake Arrowhead just to check out Rosewood Cabins. You'll go up there to check out at least a couple and perhaps over to Big Bear on the same day. There are a few different places to have weddings and receptions in these mountain communities. The wineries in Temecula got together and pooled their resources many years ago to market the Temecula wineries as a great place to have a wedding and/or reception. If the mountain communities have done this it hasn't been as effective. What you have are a couple large venues that do the majority of the weddings because they have larger budgets for marketing and advertising. I'm really excited to include Pine Rose Cabins to the Wedding Venue Reviews because its worthy of consideration, especially if you're going up the hill to check out one of the larger venues. One of the cool things about having a local-destination wedding is you can eliminate the flakes from your wedding guest list very quickly. You know exactly what I am talking about, the people you don't want to invite but are obligated to invite. If they have to drive 20 minutes to go to your wedding they will somehow show up. But if they have to drive over an hour and a half to get to your wedding AND get a room they'll somehow just find it easier to send the gift. A 200 person wedding is a tad bit larger than most weddings we see. So, the way to look at this is this way. If you were going to need to have a 300 person wedding at a local golf course, you should be able to cut your guest list down to 200 people. The people who don't really want to invite will most likely send their regrets and you can invite your buddies instead. You can send out more invites because realistically less people will come. There is a strategy behind this. If you are planning to have a 120 person wedding the 90 guest location should work because some people will drop off your list. I like Pine Rose Cabins. It's neat, different, and a bit of well kept secret. The staff seems friendly, the food was good and I had a pleasant experience. My bride who had her wedding here had no major complaints to speak of and she was a strong enough gal to speak her mind if she didn't have a good experience. If this is one of the first reviews you've read from us the bottom line is that after 15 years of wedding photography most venues treat us at least as well as the guest. Some don't but most do. How they treat us is irrelevant. What's important to me is how well a wedding venue does in living up to the expectations it creates for the bride and groom. I've had some lousy vendor meals in my time but I had better ones the next day. When it comes to weddings the venues only have one shot to get things right. Since the bride had a very good experience at the Rose Wood Cabins I feel comfortable suggesting it.